The sea stories about the Red Sea made us apprehensive - strong head winds, big seas and conflicts in the neighboring countries. The weather cooperated and we only had 1 day of boat-stopping headwinds, and despite anti-US sentiment on their treatment of Iraq, people were quite friendly to us. 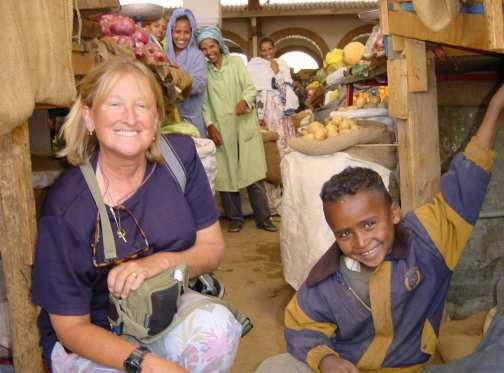 The Trip - Our six-week cruise through the Red Sea was probably typical - we sailed most of the way from the south entrance to Massawa and then waited for light winds so we could motor the rest of the way to the Suez Canal. We had intended to day-hop and avoid traveling at night, but when we had light winds we tended to press on as long as it lasted. The Cultures - The countries are poor and frequently turbulent with internal and external wars, but calm prevailed in 2003 and the people were very friendly to those of us traveling from other countries. Men usually wore robes and head wraps, logical clothing for this climate, and women often were veiled, either all black as in Yemen or in bright colors in Sudan. Merchants would negotiate for the best deal, but were honest in their dealings with us (except in Egypt). Islam is the religion of most countries but religious freedom is common. We found that Salam 'alekum (Peace be with you) is the greeting that will bring smiles in all of the Arab world. The Weather - The Red Sea has a reputation for being a nasty piece for water, where winds are often on the nose and one must pick the weather windows carefully. Our year seemed typical with southerly winds from the south end to Massawa and northerlies from there to the Gulf of Suez. Sometimes we were hunkered down for a week with 20-40 knots winds, and other times we gratefully motored for 4 days in no wind. Our Journals - If interested in our trip, check April 2003 for the passage through Eritrea and Sudan and May 2003 for Sudan and Egypt. This may be the first time in your cruising that you encounter people in real need. We had wished that we had been better prepared to help those who were so kind and helpful to us. It is not our policy to indiscriminately hand out "gifts" to people, especially when asked for gifts by officials, but there were times when we wished we had items to give to those who visited us. We were able to give some water and diesel fuel to some itinerant fisherman who needed it and we gave some small bags of tea, coffee and rice to others who visited us. Other times we were asked for magazines and books which we were happy to give if we thought they would not cause offence or embarrassment to the recipients. Our suggestion would be to bring along a few extra of the following items to give to people who come out to visit your boat, or if you go ashore to visit or take photos. We ask that you please try to refrain from handing out candy "bon-bons", pens, etc. to children you meet. It is our view that these children are just being taught to beg for things from foreigners. A better option would be to take the suggestion from the Lonely Planet Guide and make a donation to a school or charity organization in the area. This poor country, with a vast coastline on the Red Sea, was a fascinating mixture of African appearances, Italian tastes, and smiling people. We first stopped in Assab, a port with no activity and no people and then settled into Massawa with 6 other cruisers to travel to the interior. The people were friendly and honest and were attempting to re-build their country after decades of conflict with Ethiopia. The people at the right show how happy they are to see foreign visitors even though we spent relatively little in their country. Check out our Eritrea page for more about our stop and experiences with camels, creamy ice cream, and more. 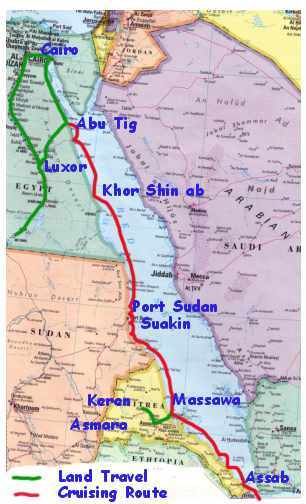 Sudan ranks about as low as Eritrea when is comes to income, mostly because of their internal strife. We found Suakin a wonderful place; picturesque and friendly, although a little frightening at first because of the demolished buildings beside the anchorage (check our Sudan page for the explanation). Port Sudan was dirty and crowded, but the markets with their tailor shops, donkey carts and grocery stores were a real eye-opener. We enjoyed several anchorages along the coast, and will always remember the fisherman who stopped by one morning before heading out to the reef to fish. Read more about our experiences on the Sudan page. Egypt has been a tourist destination for hundreds of years, and we found the culture seems to be one of trying to extract as much from the visitor as possible. 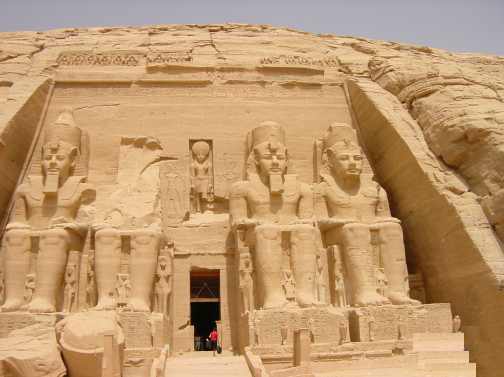 The wonders left by the pharaohs 2000 to 4000 years ago must be seen, and no travel through this part of the world would be complete without gazing up at the pyramids or wandering through a 4000-year old tomb with exquisite carvings. We based ourselves at a modern marina at the north end of the Red Sea and traveled to Luxor, Aswan, the Nile, and Cairo and have albums full of wonderful pictures. Read more about this on our Egypt page.